The Waikato Regional Council (WRC and previously Environment Waikato is working to clear the Hirangi Arm. This is the water that breaks from the main stream in the area of the Swirl Pool abd flows under normal conditios as a small stream before re entering the main stream of the river on the True left at the top of the Reed Pool. The hirangi Arm is not to be confused with the Hirangi Stream which is a stream in its own right before it reaches the Tongariro River between the tail of the Reed Pool and the head of the Jones Pool, again on the true left. The Hirangi stream starts from a spring within the town. Two large diggers are at work. The first is piling the willows as they are being cut in preparation for burning. 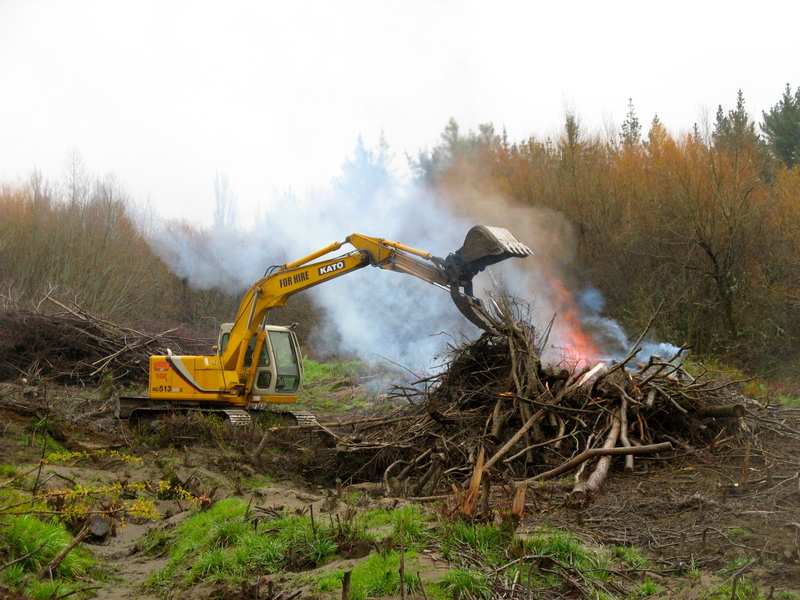 The second is adding willows to the burning pile. 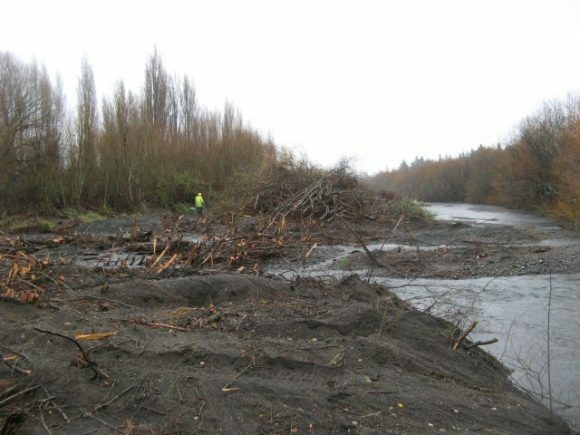 Concern has been expressed that the stumps of the cut willows will simply resprout and that is happening to the willows cut earlier this year. I have checked with WRC who inform me that either the stumps will be removed or the regrowth poisoned later this year. Despite the work taking place here 1 blue duck has taken up residence at the head of the Bain Pool. This duck seems completely at peace with the work of machines and the passage of anglers. The native birds are a feature of the river and it is a pivilege to share the river with such a rare species. 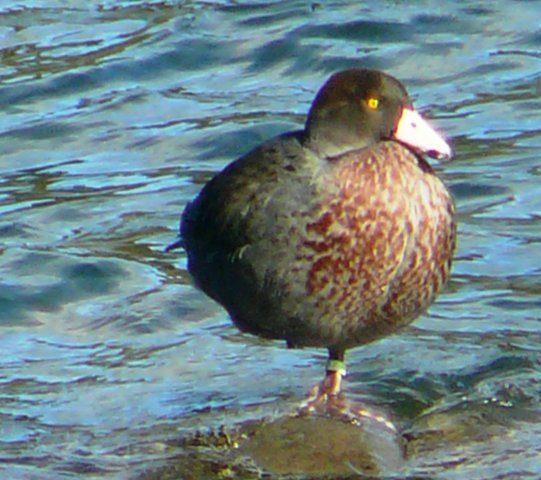 There are only 4 species of torrent duck in the world and the Whio is the rarest. This is the first year that I have seen Blue Duck downstream of the Main Road Bridge. The pointed white beak easily distinguishes them from other ducks. Harry Hamilton checked my license on Tuesday around 2.00pm. In our conversation he said that he had covered most of the river that day and measured just 6 fish. The best was a 7lb Brown trout caught in the Nridge Pool. At a guess Harry would have seen probably a quarter of the fish caught that day. There are fish around but you are lucky to get one or two a day. Sand and Silt in the river. I have reported that there is a lot of sand and silt in the river in all sections of the river. I understand that the gates were opened at both Rangipo and Poutu structures during recent floods which has resulted in the increased levels of silt and sand in the river. As fish do not lie on silt or sand, (they prefer gravel stream bottoms), perhaps the fish are passing quickly through the fishing stretch of the river resulting in a low catch rate and disappointed anglers.